Six suspected ISIS and Al-Nusra Front recruiters, said to come from Central Asian countries, were detained in St. Petersburg days after the blast in the city’s Metro. President Putin says any post-Soviet country could be the target of a terrorist attack. 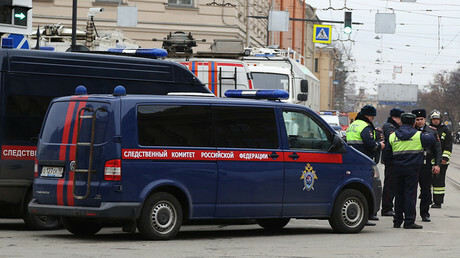 Six nationals of Central Asian countries were detained following a series of anti-terrorism raid by Russia’s Federal Security Service (FSB) the Interior Ministry and National Guard in St. Petersburg, the Investigative Committee said in a statement. The suspects, who came to Russia to seek employment, “have been recruiting people of Central Asian descent since 2015 in St. Petersburg to become followers of Islamic State [IS, formerly ISIS/ISIL] and Al Nusra Front, and to carry out terrorist attacks,” the committee said. Having searched the suspected recruiters’ flat, the security services also retrieved Islamist propaganda literature and documents, which may be a piece of intelligence worthy of further investigation. While investigators will specifically try to uncover the men’s connections, it is not yet clear if they were in contact with the prime suspect believed to have set off a suicide bomb inside the St. Petersburg Metro earlier this week, the committee said. Russian authorities said on Tuesday a 22-year-old Akbarzhon Dzhalilov is the presumed suicide bomber who carried out the attack which killed 14 people and left 49 in hospital. Dzhalilov is said to have originally come from the former Soviet Republic of Kyrgyzstan. He had lived in Russia for several years and obtained Russian citizenship. No radical group has claimed responsibility for the attack so far, nor did the investigation reveal any detail about Dzhalilov’s motives. However, suspicions are very likely to fall on the suspect’s Islamist background, possibly inspired by IS ideology. On Wednesday, Russian President Vladimir Putin acknowledged the rising terrorist threat, affecting not only Russia, but also its allies in the Commonwealth of Independent States (CIS) – an organization embracing 11 former Soviet countries. “Unfortunately, there is no sign that the security environment is improving, and tragic events in St. Petersburg are the best evidence of it,” Putin said while meeting chiefs of CIS intelligence agencies, as cited by TASS. “We do know that each of our countries, almost every country, is a potential target of a terrorist attack,” he said. “Our countries are facing many other challenges, including organized crime and drug trafficking. To tackle these threats, the allied security agencies should step up intelligence sharing and mutual ties, Putin said. Meanwhile, some other CIS leaders have already pledged their support in combatting international terrorism. Shavkat Mirziyoev, the newly-elected president of Uzbekistan who came to Russia on a state visit, told Putin terrorist threats must be met with a swift response. “Once again, we have to unite ourselves and take tough measures [on combatting terrorism],” he said.